Once there was a boy called Nachiketa. One day, his father performed a Yajna. He donated cows to the Brahmins. Nachiketa knew it was customary to offer dear things as a sacrifice to the gods. He asked his father, "Whom will you give me to?" Disturbed by his question, his father angrily replied, "I give you to Yama, the god of death." 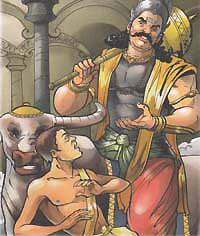 Nachiketa went to Yama's kingdom. He waited three days without food. When Yama returned, he was pleased with Nachiketa's devotion and granted him three wishes. Nachiketa asked for his father to be pleased with him. For his father to be pleased with him. For his second wish, Nachiketa asked to go to heaven. Yama agreed. Finally, Nachiketa wanted to know the secret of life and death. Yama hesitated, but looking at his determination he granted his last wish too.